The latest batch of design candidates was review by the Commission of Fine Arts (CFA) on Sept. 20 and by the Citizens Coinage Advisory Committee (CCAC) on Sept. 27. Both bodies offered their recommendations, contrasting against the first series of designs looked over by the CCAC in late July. The pair of panels liked the same design for the obverse but had different recommendations for the reverse. 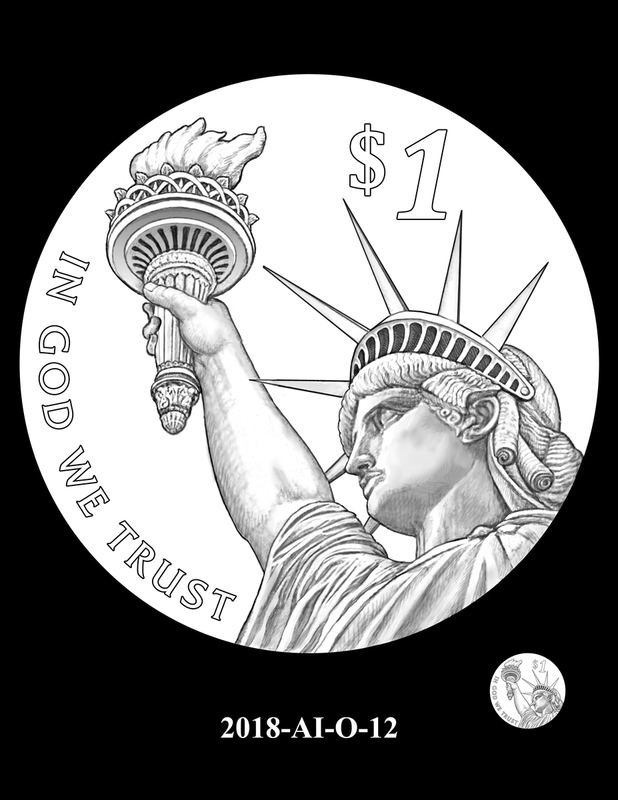 The CCAC selected obverse #8 and reverse #8, which are shown side-by-side below. In suggested changes, members passed a motion recommending tweaks to the placement of the obverse’s inscriptions. Committee members also tossed around ideas for series coins to share a privy mark — something that was similar, but smaller, than the shielded patent office symbol shown on reverse design #8, or perhaps a depiction of a gear or gears to convey innovation. The discussion ended from a lack of consensus. The CFA also approved of obverse design #8. They liked #12 as well. For the reverse, members preferred design #13. 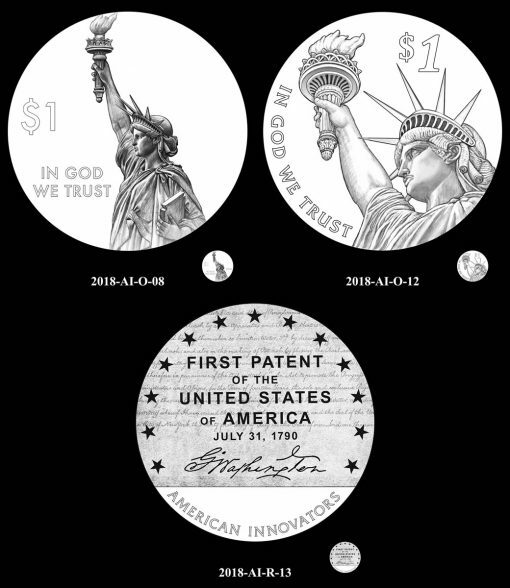 Images of these three designs follow. 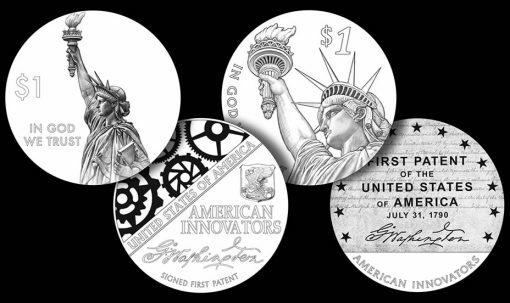 Below are U.S. Mint images and descriptions of the second round of proposed 2018 American Innovation $1 Coin designs. The obverse designs feature images of the Statue of Liberty. The common obverse design for this program, per Public Law 115-197, must feature "a likeness of the Statue of Liberty extending to the rim of the coin and large enough to provide a dramatic representation of Liberty," as well as the inscriptions "$1" and "In God We Trust." The legislation requires that the reverse of the 2018 American Innovation $1 Coin feature the inscriptions "United States of America" and "American Innovators" and a representation of the signature of George Washington on the first United States patent issued. 2018-AI-R-01 depicts George Washington’s signature on the first patent along with the inscriptions "American Innovators" and "United States of America." The design also features a quill and inkwell, symbolizing the signing of the patent, and a rising sun, symbolizing the dawning of a new era of progress with the many great innovations coming from America. 2018-AI-R-02 features George Washington’s signature above the inscription "Issued First U.S. Patent." The design also features Thomas Edison’s lightbulb as an iconic symbol of the inventions of American Innovators as well as the illumination of innovative ideas. The additional inscriptions are "American Innovators" and "United States of America." 2018-AI-R-03 depicts George Washington’s signature and the inscriptions "United States of America" and "American Innovators." 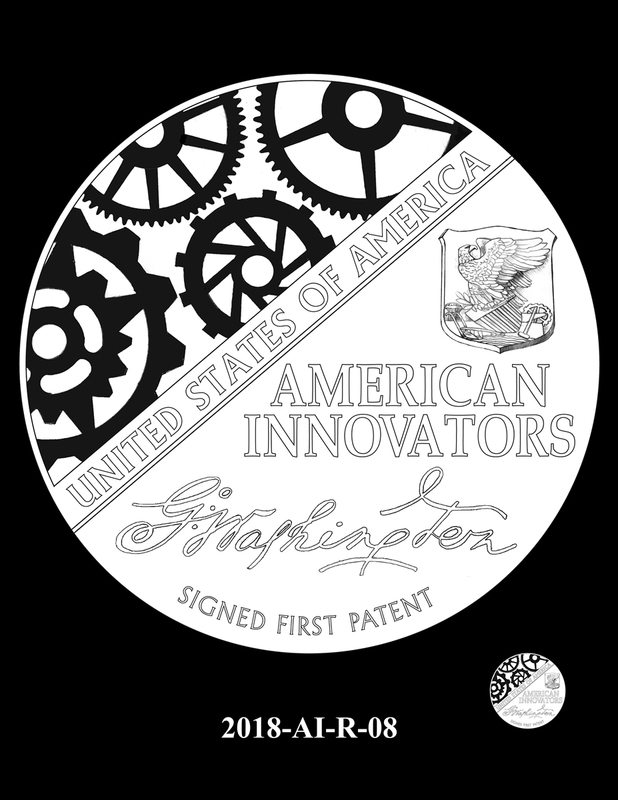 The design also features an image of the 15-star flag that was in use during the early years of the Patent Office. 2018-AI-R-04 depicts George Washington’s signature above the inscription "Signed First Patent." Additional inscriptions include "American Innovators," "1790," and "United States of America". 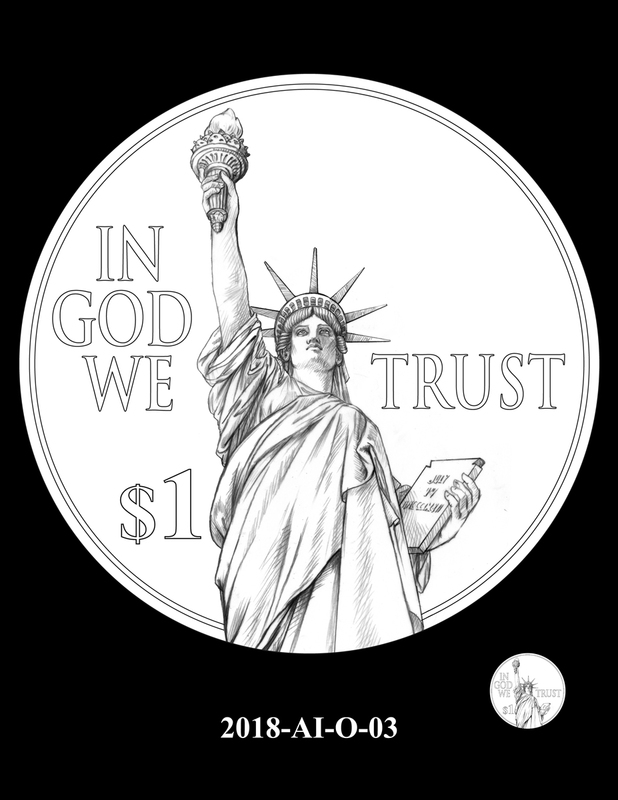 The design also features an image of the Patent Office relief found on the Herbert C. Hoover Building in Washington, D.C, the headquarters of the Department of Commerce and once the home of the U.S. Patent and Trademark Office. 2018-AI-R-05, 2018 AI-R-06, 2018-AI-R-07 and 2018-AI-R-08 feature George Washington’s signature and the inscriptions "American Innovators" and "United States of America." 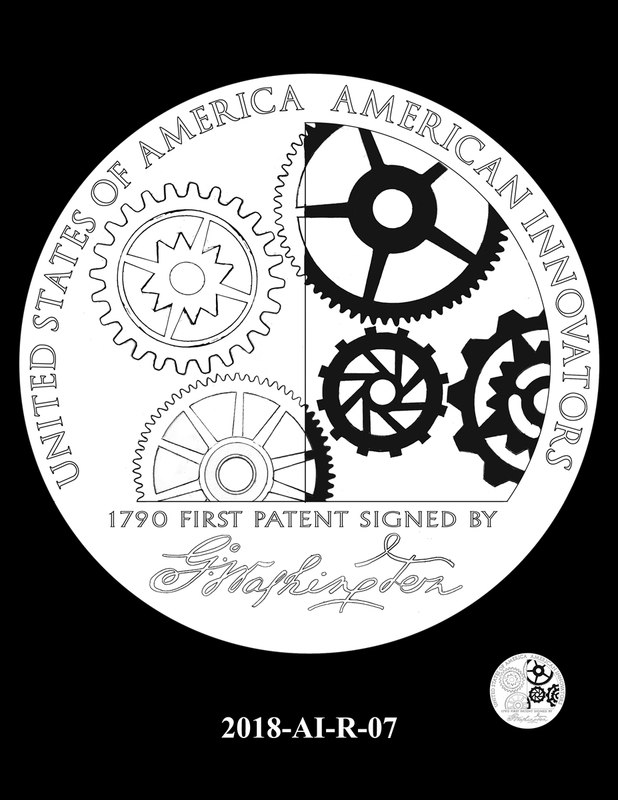 The stylized gears represent industry and innovation. Design 07 features the inscription "1790 First Patent Signed By" above Washington’s signature. Designs 05 and 08 include the inscription "Signed First Patent" under Washington’s signature, with Design 05 also featuring the inscription "1790". 2018-AI-R-09 features George Washington’s signature on the first patent, as if inscribed on a piece of paper, and the inscriptions "American Innovators" and "United States of America." The cowboy hat has come to symbolize an independent spirit and resilient nature. The design also features the American created C computer programming language, shown here as a code to display the words "United States of America." Finally, the Phillips head screw, another American invention, is featured on the border. 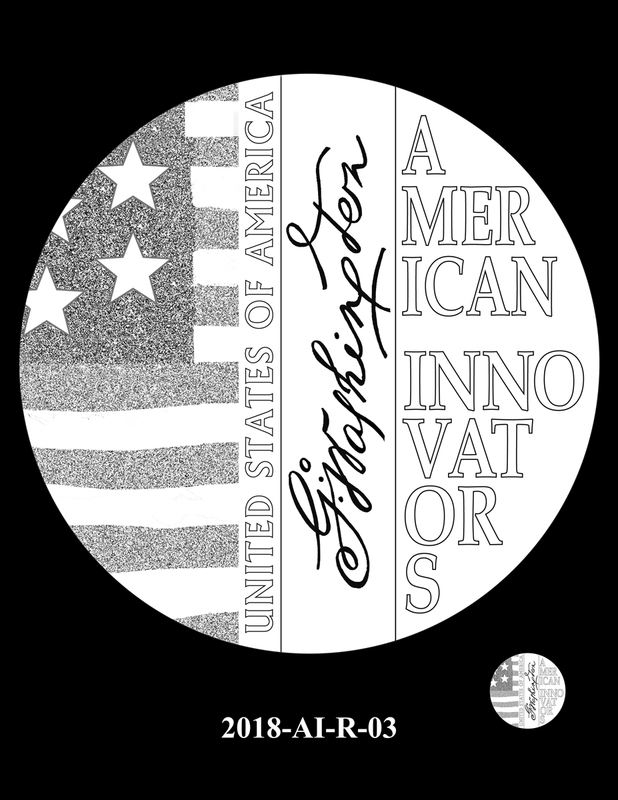 2018-AI-R-10 features George Washington’s signature and the inscriptions "American Innovators" and "United States of America." The design also features a cowboy hat and astronaut, depicted as if on separate piece of paper, but also placed to suggest the astronaut is wearing the hat, a playful combination of two American icons to create a uniquely American figure. The Phillips head screw, another American invention, is featured on the border. 2018-AI-R-11 features George Washington’s signature on the first patent as well as a hand holding a quill, representing the moment of signing. Above the signature is potash and the fertilizer it was transformed into by the process invented by Samuel Hopkins for which the first patent was granted. Finally, the design features the inscriptions "United States of America," "First Patent," and "American Innovators." 2018-AI-R-12 features an artist’s conception of the first patent that was issued on July 31st, 1790. President George Washington, whose signature is boldly depicted below, has just signed the document as noted by the quill pen. The design also features the inscriptions "United States of America," "American Innovators," and "First U.S. Patent – July 31, 1790." 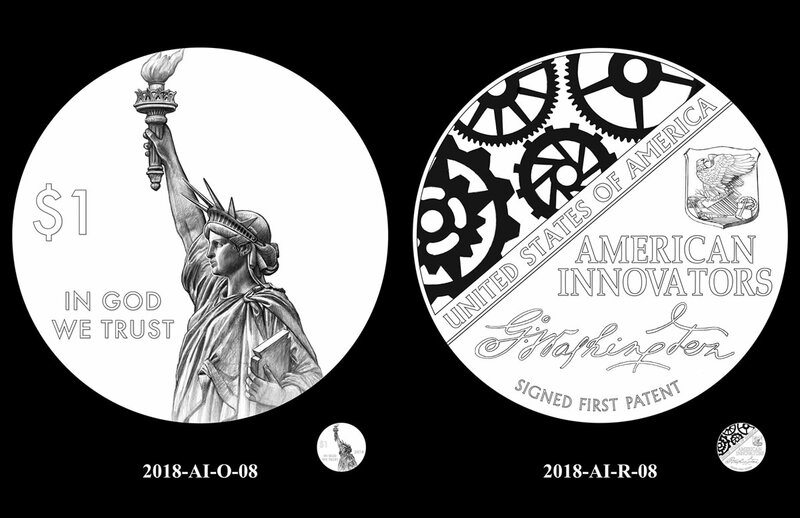 2018-AI-R-13 depicts a document representing the first U.S. patent issued, featuring a bold depiction of George Washington’s signature. 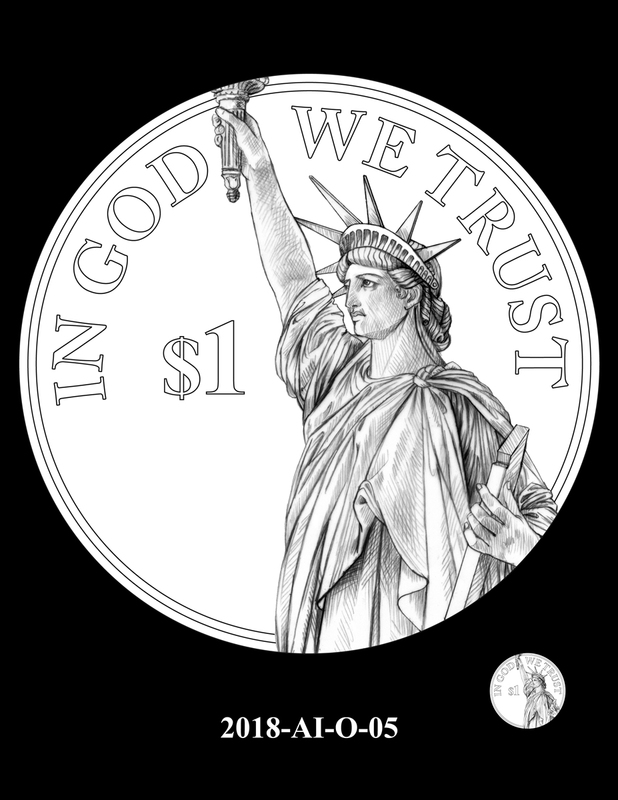 The 13 stars along the rim represent the 13 states in existence in 1790. The design also features the inscriptions "First Patent of the United States of America," "July 31, 1790," and "American Innovators." 2018-AI-R-14 depicts George Washington’s signature under a man stirring a pot. This represents the first U.S. patent, which advanced changes in the production of potash and pearl ash, considered the first industrial chemical. The design also features the inscriptions "American Innovators," "First U.S. Patent Grant," "1790," and "United States of America." Dollar coin edges are incused with the year of issue, a mint mark, and the inscription "E Pluribus Unum." 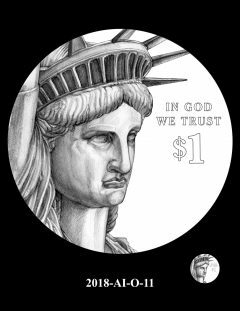 Correction: I should have said that New Zealand eliminated its 5¢ coins, not Australia (it’s been a while since I visited down under). Oz still has 5¢ coins, but both it and NZ dropped their 1¢ and 2¢ coins years ago. 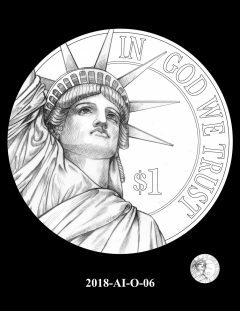 what a waste, bought the presidential dollars just to complete the series, but won’t be buying these. 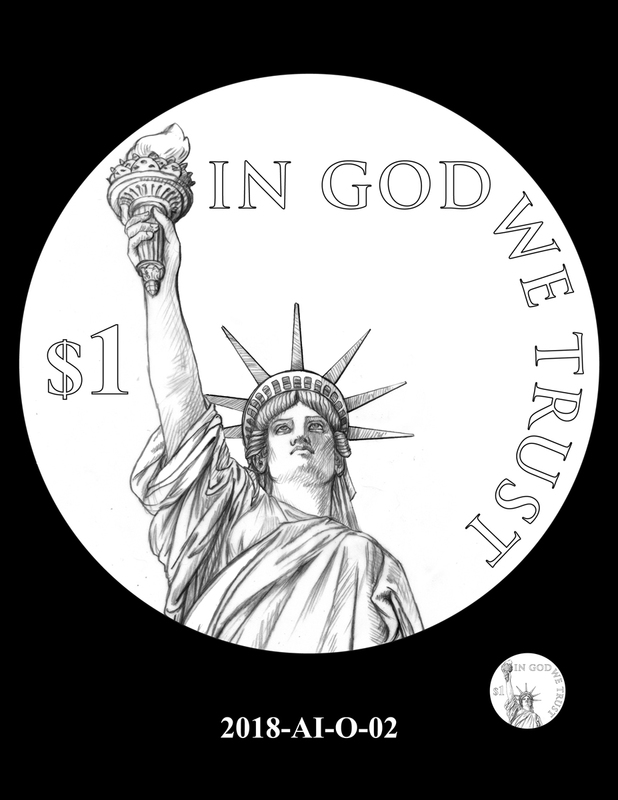 The “In God We Trust” motto is obnoxiously large on some of those design candidates. 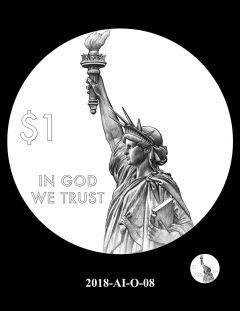 Almost if they want to make extra sure there isn’t a repeat of that manufactured “Godless dollars” debacle. 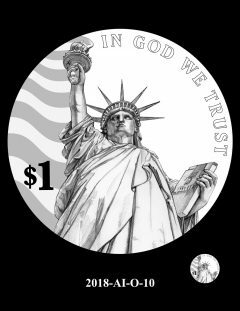 One of these days, Congress will bite the bullet and dollar bills will be discontinued and dollar coins will flood the marketplace but with all these unlikely-to-be-seen designs, I wonder how the public will handle the coins when someone tries to spend them? There is plenty of room for the date and mintmark on the proposed obverses. I wish they’d put them back on the obverse. The Sacagawea dollars just look odd with that blank space where the date should be.